Hi there! I'm getting so excited! Today, I get to place my pre-order from the new catalog! Wohoo! (Insert happy happy face) Just another perk for being a demonstrator. But, I do have to tell you, the retiring list is beginning to show "sold out" on many products. I can't stress enough, that if you want something that is on that list, you can't wait, chances are you will not be able to get it. 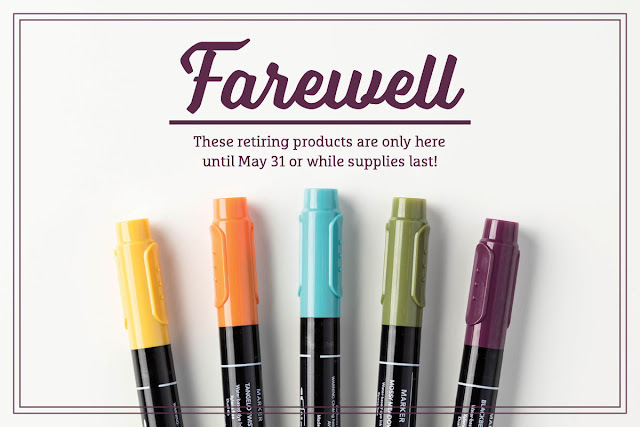 The stamp sets are being manufactured until 5/22 but ALL other products are "while supplies last" and they are not lasting long at all especially the retiring In-colors....anything with those colors are going very quickly. I also want to point out that if you have been considering the idea of signing up as a demonstrator and joining the Stampin' Up! family, now is a great time because you can select items from the pre-order options for your starter kit! Yes, you too can take part in the pre-order that the rest of us demonstrators get to partake in. Just a little food for thought. I have to run now, but I will be back Thursday with a project for you so until then, happy stamping.